The next step was to discuss the validity of questions. Ground rules were created to encourage students to ask good questions about each other’s presentations, and to move away from a focus on getting the right answers. We debated open and closed questions, worked on this at home, and then shared good ideas for why open-ended questions are so much more interesting than closed questions. We have a strict rule that no question is a bad question, but all good questions lead to more questions! It was tough for me to take a step back and wait while students took needed time to shift from answer to question. Initially, they copied each other’s questions, but slowly the conversation opened up to more interesting questions as I role modeled a few of my own questions. There were a few students who wanted to give answers, but we had to rein ourselves in and come back to the driving questions around ecosystems. It was definitely a learning curve to move away from the ‘googlable’ answer to understand what we wanted to research further. Students were then encouraged to use Pebble Go as a launching base to further their research and examine more about their topic. Again, they shared their learning using Flipgrid. Some presented beautiful flowcharts, others used the cool iPad app which comes within the Pebble Go, whilst others made their own dioramas or research reports on the biodiversity of ecosystems in British Columbia and beyond. Again, the focus was on asking questions about the research, as well as learning from the students who were co-teaching their peers. We touched on the socio-emotional learning as well with questions reflecting how they were feeling as they researched. Most students enjoyed the process of researching what they wanted to discover. Some students shared that making their inventions in the first week was difficult because they could not get the right results. The time taken for producing was perhaps not conducive for further learning. I had given a framework of one hour per week to work on assignments, but am discovering we may need more time. I believe in Inquiry because I believe it fosters a self-directed and self-driven desire to life-long, continued education. A child/student who learns to intrinsically ask questions and seek answers through a research driven process such as GID will most likely become an adult who continues to learn, question, research. I further believe that GID is much needed, to discourage and discontinue the current trend towards believing fake news, false information, scams, etc. Because of my beliefs, I am always searching for ways to encourage student driven Inquiry. 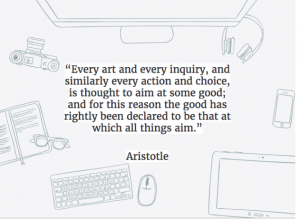 Most recently at my campus, I have begun to find and publicize technology apps and programs that either promote Inquiry, provide a great platform for Inquiry or can easily be integrated into a unit of Inquiry. Apps and websites such as wonderopolis.com and recap provide a safe place for students to wonder, ask questions and seek answers. Other technology can be used to promote shared note taking (Google docs is one such technological advantage in this area). Technology can also be used to organize ideas, and present findings (such as movie making with iMovie or screencastify). I would not say that any one app or website has become widely used across grade levels at my campus. This is another example of an early stage plan to widely promote GID at my campus. Therefore, I would love to learn more such apps and websites from all my GID colleagues. If you have an app or website your campus uses, please leave me a comment with the name and description of use! I look forward to adding to my list! Each year at Kujawa to culminate the elementary level education, the graduating class completes a unit of inquiry we refer to in IB as Exhibition. Think history fair type of event and you will have a general idea of the type of work the students go through in preparation for their big day. This year our new Principal, Kim Jenkins brought to me an idea of a Book Tasting. When I began to look into “book tasting” activities, I realized this would be a perfect way to begin the immerse stage of GID within this unit of inquiry. This will be our first attempt at “Book Tasting” so any advice you have to share would be most welcome! Our purpose in this unit is for students to follow an inquiry into the ways in which we discover and express ideas, feelings, culture, beliefs and values; the ways in which we reflect on, extend and enjoy our creativity; our appreciation of the aesthetic. Arranging a “sampling” of books that depict these inquiry strands will begin the immersion process. My plans are to produce a place-mat, a menu of countries, and a note taking page yet to be designed. A buffet of books that relate to various cultures will be on each table. Students will spend five minutes sampling 3-4 books. 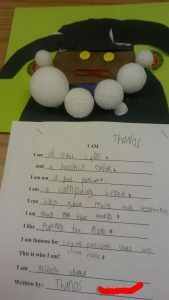 One of the best things about Guided Inquiry is that it allows teachers to allow students to “think outside of the box”. Common Core and many other education initiatives eliminated the ability for students to learn at their own place and in their own way. 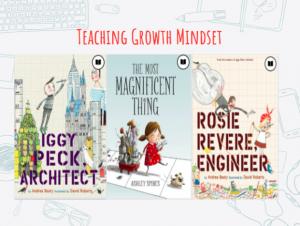 Guided Inquiry allows for creativity, and self-paced research with the child in the driver’s seat of their learning. With this model, the teachers and librarians guide and encourage students to feed their curiosity and creativity. When we allow students to inquire and create in this way their engagement and learning skyrockets. The second grade students and teacher at the school where I serve as librarian embraced the Guided Inquiry process when they were investigating Presidents and First Ladies. The student engagement was incredible. Some students said they had never read, learned, and written as much as they did during this unit of study! The inquiry circles allowed students to share what they found interesting and inspiration about our past Presidents and First Ladies. They shared similarities between the Presidents and made connections that might not have been made if a traditional research approach had been used for this unit. 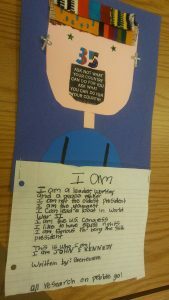 Once the students had completed the Gather Phase for this project, I read What Presidents Are Made Of by Hanock Piven. We discussed the collage-like illustrations and made connections with the materials he chose in order to create several of the President’s portraits. 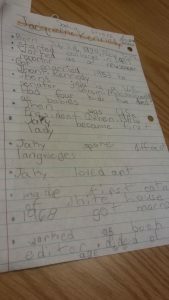 The students used the ideas from this text to brainstorm a list of objects that connected with the President or First Lady they had learned about during the unit. Many students brought things from home, however, I provided many miscellaneous items for them to use for the Create Phase. Our MakerSpace tasks for the month of March was to create President/First Lady portraits. Guided Inquiry and MakerSpace are a match made in heaven. I was very pleased with the growth I saw in students throughout this unit. They learned to take notes instead of copy information from a resource, and they learned how to discuss and share what they had learned with their classmates. 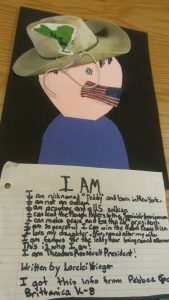 Students could choose to create a collage or pen an “I AM…” poem about their chosen historical figure. Several students chose to complete both tasks. Their products illustrate a small portion of their learning. 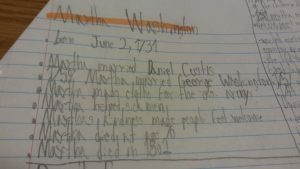 Below, you can see some examples from the Create Phase of the Presidential Guided Inquiry Unit. Howdy again from the Lone Star State! My name is Tara Rollins and this is my second year to post to the blog. You can find my previous entries in October 2016 (last three entries) http://52guidedinquiry.edublogs.org/2016/10/. It has been an interesting year in Houston. We started school this year on the day of the solar eclipse. The next week, we were inundated with 51 inches of rain during Hurricane Harvey. We were out of school for over a week and many areas of town are still in recovery mode. Needless to say the year has been a little bit hectic. However, we have lots of good inquiry projects ongoing and in the planning stages! When I last spoke to you, I mentioned the time constraint that many of us face in continuing a unit of inquiry. Over the summer, a collaborative effort was made to begin to place some units of inquiry into Google Classroom. These classrooms can be shared with teachers and/or students and can be used in technology centers throughout the units in groups, pairs, or alone. Of course units have to be flexible, so needless to say the “Open” we planned in July for the 2nd grade Natural Disasters Inquiry needed to be changed from the picture below due to our experiences during Hurricane Harvey in August. What a difference a month can make in planning and implementing GID! However, having it on our Google Classroom platform made it as simple as changing a picture/URL. I do not mean to imply that all of our inquiry is done in centers, nor is it all completed or implemented through technology. The Google Classroom option is merely one tool that I have added this year to encourage teachers and students to push on with inquiry even when the librarian is not able to co-teach each lesson. It also is a great way to share what’s going on with parents (although that has not been implemented as of yet at my campus). Howdy, from the Sooner State! My name is Jamie Johnson and this is my first G.I. blog post! I have been an elementary school librarian in Norman, Oklahoma for sixteen years. I started learning about Guided Inquiry in the spring of 2015 when Leslie Maniotes shared her knowledge and experiences with librarians and gifted resource coordinators from across our school district. I will be sharing a few strategies that worked for me and our second grade team when we used Guided Inquiry to investigate Presidents and First Ladies last spring.